Gone are those days when you've to ask people for the direction before going to any new place. Now everything is on your fingertips and you can search them on Internet. 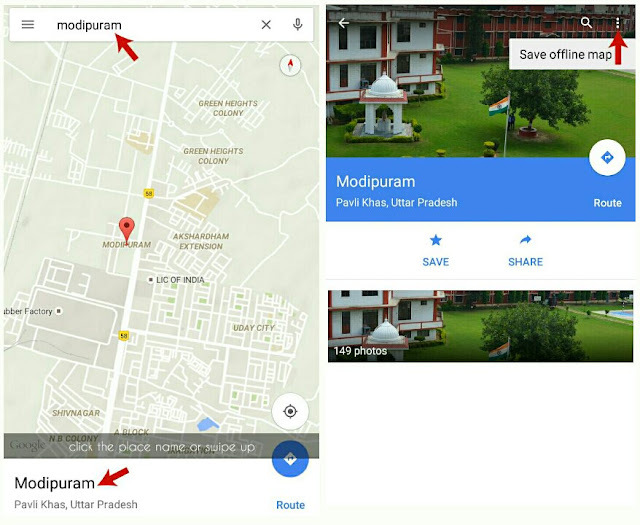 Google Maps is undoubtedly, the best service which can help you to search places, shops, hotels, bars, malls, stations and even houses at your nearby place. You can also get the direction with different routes and check out the photos. Before going on trip, I usually mark places where I have to visit and it's pretty much easy with Google Maps. Although it works in Internet connection but good things is that, you can also save those maps for offline use. It can be helpful when you're in remote area where you're unable to access Internet connection. 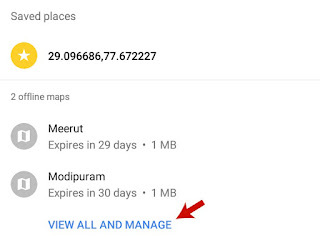 In this tutorial, I will guide you how to save those Google Maps offline on your Android device. First of all, open Android Google Maps app. Now manually find or search the place/area that you want to save. After this, scroll the screen from left to right or click the menu button (three parallel lines). Now click on "Your Places" option and then click "View all and manage". At the bottom of screen, you'll find "Save a new offline map" button. Simply click it. Now pan and zoom to adjust the map. Once you've finished, click save button and then name it. Again hit save button and that's it. Note: Before saving it, make sure that your phone have access to Internet connection and you're logged into your Google account. 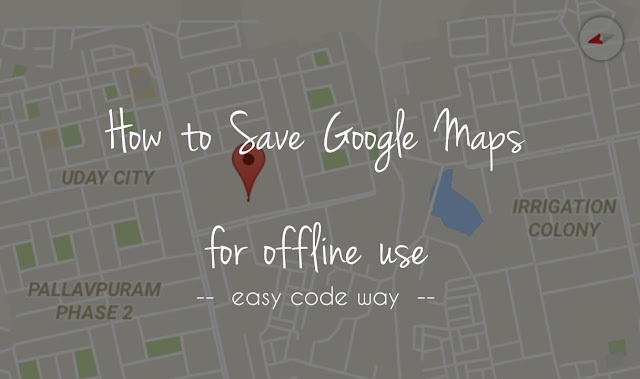 There is another manual way to save offline map. In that, first you to search the place using search bar. After finding it, swipe the screen up or click the place name. It will show you the place information. Now click on menu button (three dots) as shown in below picture. After this, follow above 6th step and that's it. 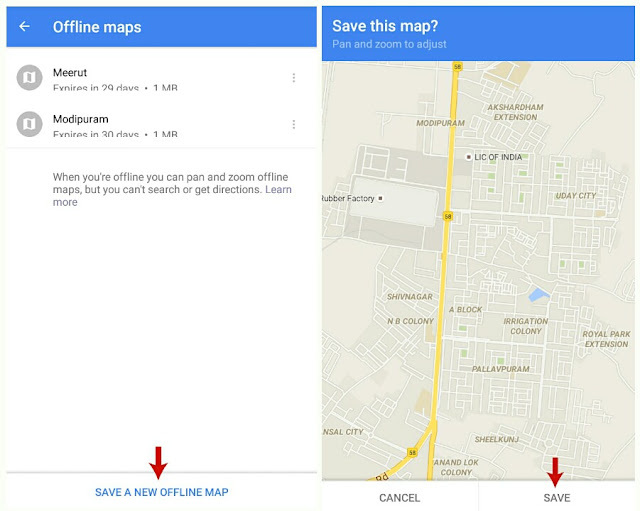 How to view saved offline maps? It's pretty much easy to view the maps that you've saved earlier. First of all, open Android Google Maps app and then click on menu button (three parallel lines) or scroll the screen from left to right. Now go to "Your Places > View all and manage". Here you'll find all offline maps that you've saved. To view any, simply click on the its name. You can't search places. You've to find everything manually as like you search them on paper map. Offline maps will expire after 30 days and you've to update them again. So before going to anywhere, make sure to update them otherwise they will be of no use. You can't save the complete map of country (of course), state and big cities using this method. You'll get an error message as "Area too large, zoom in". The more large area will be, more will be the size of map. You can't get the direction between two places. There is no way to measure the distance. You can't find your current location. 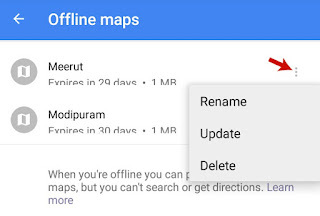 Sometimes you may want to rename, update and delete these offline maps. To do that, again go to "Your Places > View all and manage". Now click on menu button (three dots) next to the map you want to select and then choose any of the action. You can easily rename, update and delete them from here. 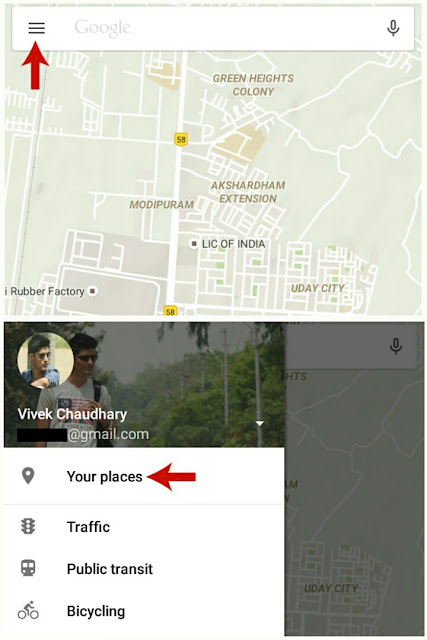 This is all what you need to know about offline Google Maps. If you're facing any problem, fell free to ask me in below comment box. Stay tuned for more interesting Android tutorials. Love and blessings!